Ashlyn Dunn poses by the hydroponic, vertical farm wall. 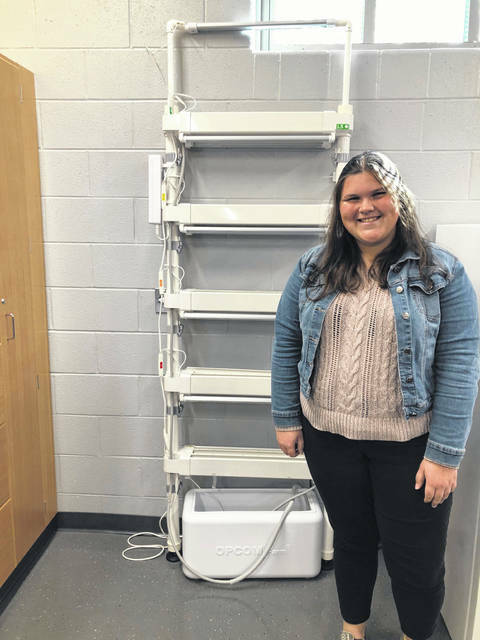 Urbana FFA President Ashlyn Dunn applied for the Champaign County Farm Bureau Grant on Aug. 30 to purchase a Hydroponic Farm Wall. The grant request was successful. The Hydroponic Farm Wall will spark the green thumb in our members, provide hands-on experience with plants, opportunities for student research on plant nutrition, hydroponics, vertical farming vs. traditional, plant variety performance comparisons, and much more. Additionally, what is produced can be fresh vegetables, fruit and herbs for the chapter to share and serve to staff at events. As a large majority of our FFA chapter lives in the “urban” area of our town, they lose out on the experience of growing their own fruits, vegetables and herbs at home. Our chapter wants to use the Hydroponic Farm Wall to show our members that you can grow these items even if you live in the middle of our suburban town. We also hope to grow the number of members who have garden SAE projects and in turn have more garden project entries in the 2019 Champaign County Fair. Within our community there is not space for a ‘community garden,’ nor is there a want to start one. With this program we can show the benefits of growing your own vegetables and fruits and how to grow them at home in the space you have. This can promote healthy eating within our chapter, cause a spark in an overall uninterested students. Receiving this grant will greatly impact our chapter and our community. We are very gracious for receiving this, and would like to thank the Champaign County Farm Bureau. Taylor Cordial is the Urbana FFA Reporter.